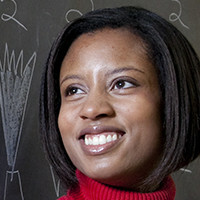 Stephanie Luster is Lead Architect for Innovation Builders. Prior to this role, Stephanie was Senior Fellow and Design Engineer at AMD, CTO of the Dell Consumer Group, and Director of Computer Sciences for Landmark Graphics / Halliburton. Her interests and experience range from the tiniest IOT devices to the largest high-performance computing environments and she is currently focused on building systems that integrate those two worlds. He became a die-hard feminist overnight. OVERNIGHT! Absolutely! I'm glad someone gets it. Let's spread the word all over the world. Stephanie hasn't suggested anything yet. Stephanie hasn't shared any story yet.